Your iMeet® Central interface can be made to “look and feel” like your corporate website with custom branding, colors, and styles. The look and feel settings can be accessed by navigating to the company admin menu (gear icon in the top right) and selecting Company Setup > Look & Feel. For quick and easy branding of your iMeet® Central interface, upload your logo by going to Company Setup > Look & Feel > Logo and Favicon. Choose a file to upload to the company Logo area, select upload, and you will be presented with a logo cropper. Crop the photo to your liking and select Save Image. The ideal size for all logos in our system is 200x50 pixels,so if an image is smaller than that, say 100x100 then our system will only be able to grab 100x50 because the cropping is determined by the width. This simply means that all images need to be at least 200 pixels in width, if the logo is smaller than that you will need to grab some white space around it to get it up to 200 pixels. The logo which is uploaded in this area will appear on the login page for your company. A favicon can also be added. It is important to pay attention to the dimensions of the Favicon (16 x 16) as described below the up-loader to avoid distortion of the image. Images cannot be removed when uploaded here, they will need to be replaced by another file to be changed. To adjust the colors of the Company, go to the Colors tab within Look and Feel. From here you will be able to adjust the default company colors for the top bar background, the top bar text, the button background, the button text, the inactive tab background, and the inactive tab text. You can also choose to apply the change to all existing Workspaces. A Custom Login page allows your members to login from your company website, or any public-facing web page. 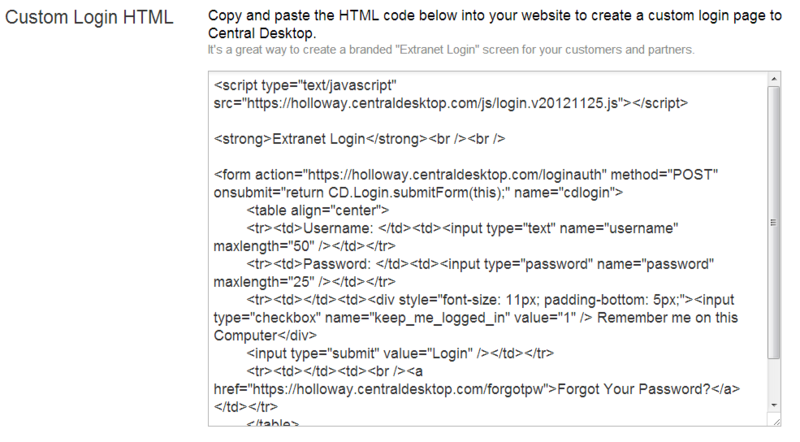 Simply copy the code provided, paste into your web page, and customize as desired. Note: Requires some HTML experience/knowledge.